The SAM D21 Xplained Pro evaluation kit is ideal for evaluation and prototyping with the SAM D21 Cortex®-M0+ processor-based microcontrollers. 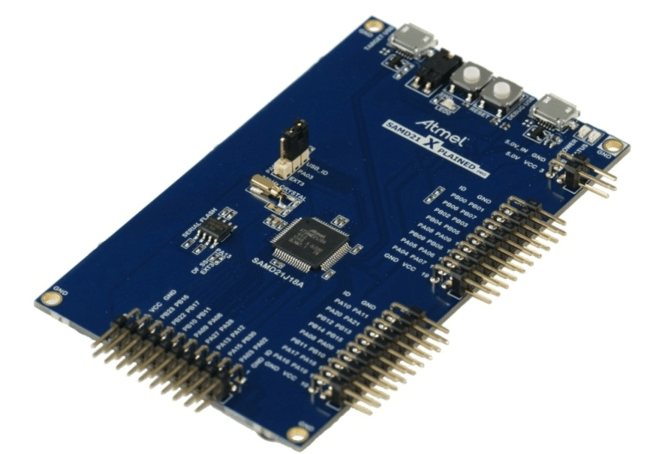 The kit includes Atmel’s Embedded Debugger (EDBG), which provides a full debug interface without the need for additional hardware. The default configuration can be found in the Kconfig boards/arm/atsamd21_xpro/atsamd21_xpro_defconfig. The SAM D21 Xplained Pro evaluation kit has 3 GPIO controllers. These controllers are responsible for pin muxing, input/output, pull-up, etc. For mode details please refer to SAM D21 Family Datasheet  and the SAM D21 Xplained Pro Schematic . The SAMD21 MCU has six SERCOM based USARTs with three configured as USARTs in this BSP. SERCOM3 is the default Zephyr console. The SAMD21 MCU has 6 SERCOM based SPIs. On the SAM D21 Xplained Pro, SERCOM5 is connected to an 8 megabit SPI flash. 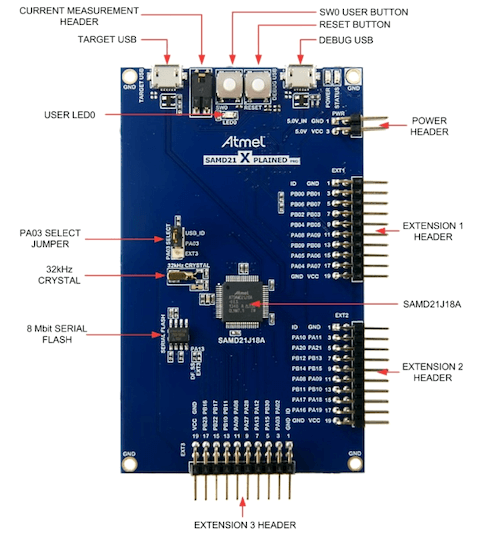 The SAM D21 Xplained Pro comes with a Atmel Embedded Debugger (EDBG). This provides a debug interface to the SAMD21 chip and is supported by OpenOCD. Connect the SAM D21 Xplained Pro to your host computer using the USB debug port.